Our equipment Eliminates the need to refer you to a specialist for further testing. We will oftentimes have the equipment here in the office and the testing can be done immediately, which decreases the need for multiple visits. 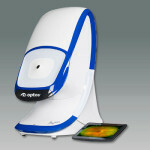 OCT, OPTOS Daytona System, and Diopsys NOVA Vision Testing System. Our OPTOS Daytona System eliminates the need for the Doctor to dilate your eyes. It also allows him to obtain a 200 degree digital image of the retina vs the 30-45 degrees of view obtained by the average optometrist. The optomap exam is fast, painless and comfortable. Nothing touches your eye at any time. It is suitable for the whole family. To have the exam, you simply look into the device one eye at a time (like looking through a keyhole) and you will see a comfortable flash of light to let you know the image of your retina has been taken. The Diopsys® NOVA Vision Testing System provides Dr. Bouton with painless, non-invasive vision tests that utilize electrophysiological technology, including Visual Evoked Potential (VEP) and pattern Electroretinography (ERG). The purpose of these tests is to provide comprehensive information to assist Dr. Bouton in better planning your treatment (if needed) and monitoring the results. Visual Evoked Potential (VEP) measures the electrical activity in the vision system. When light from an image enters your eye, it is converted into electrical energy at the retina and travels through the optic nerve to the visual cortex of the brain which processes vision. The Diopsys® NOVA-VEP test measures the strength of the signal reaching your visual cortex and how fast it gets there. The VEP technology in the Diopsys® NOVA device helps determine how your eyes communicate with your brain in a way that no other instrument or vision test can. Pattern Electroretinography (ERG) measures the function of your retina-the light-sensitive layer at the back of your eye. When light from an image enters the eye, it is converted into electrical energy by specialized cells in the retina. These cells send electrical impulses through the optic nerve to the brain where the image is processed. The Diopsys® NOVA-ERGtest records how well the cells of the retina are conveying electrical impulses within the eye. ERG results have been demonstrated to aid in the diagnosis and treatment planning of many vision disorders. Being able to make and cut lenses right on site, we can greatly reduce the wait time for a pair of glasses. We custom craft each lens to achieve optimal look and performance. Most repairs can be done in house, and many common prescriptions are available from our in-house lab for a fast turn around time.